I just bought a eeePC 701, and was looking for a way to use less screen space, because a lot of windows just fo not fit it's resolution. Changing font size to 7 helped a lot, but still widgets like buttons take too much space. - is it possible to use qt4 stylesheets with kde apps? 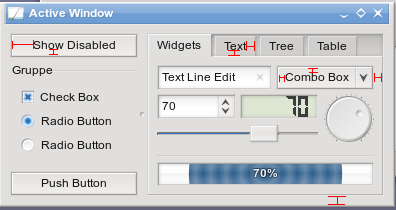 if so, it would possible to create a generic theme that only loaded one of those and users could create a qss file to theme KDE4 apps? Won't this only affect fonts? I've already reduced fonts a lot, but I'll give a try anyway. Maybe you can try Plastique, a plastik clone by Trolltech. It's already smaller than oxygen, and in time someone might create an even better style. It has no relations with oxygen style at all it's absolutely different theme. And in my opinion worse. Oxygen should be polished a lot, but not changed with some new theme. Basicaly oxygen is very good style and it's important to develop it. Ability to do it more slim would be essential for it. I want to find a way to remove/minimize the spacings marked as red lines. This non-compact gnome theme really has huge buttons, so the need for a compact theme is urgent there. But I do not like the compressed horizontal size of the buttons, the margin is a bit too small for my taste. With Skulpture the sizing and spacing depends on font size, so with a smaller font, you get a smaller layout. The width of buttons is increased in steps to make similar-sized buttons get the same size; this could be improved, though. As far as I can tell the minimum width of the left hand splitter with the buttons Iuri feels are too wide is controlled by the radiobutton group and its contents - the buttons at top and bottom are just expanding to fill the available space as set by their default size policy. Yes, but in most cases buttons are not aligned to another widget, they are just side by side (you know, the ok, apply, cancel triad). There is too much spacing wasted in most KDE apps. Yesterday I was testing this stile you guys told me about and others, and there was one (sorry, I do not recall witch one) that was using a ABSURD amount of emptiness in it's configuration dialog. The good news is that I was able to run dolphin using a .qss file to change some parts of it's appearance - currently I saw only tabs being colored. So maybe I can do the tricky using a .qss file. Plus, it's a way to theme KDE that I saw no one using yet that is much, MUCH easier than coding a style in C++. I'll open a bug for KDE to support themes throught qss files, let's see what happens with the idea. here is a rather basic patch accomplishing what you want. HTH. With Skulpture 0.2.0 you can create a "compact" layout. But many application use hard coded values, so it will not work everywhere. And you can experiment with .qss files, just pass "-stylesheet file.qss" as an argument to the application you want to run. Someone mentioned in this thread that using Xgl would reduce the performance issues on proprietary graphics card drivers. On suse10.3/kde4.0.4 I can simply switch to Xgl (and yes, I can even do smooth scrolling in konqueror again! ), but all desktop effects are gone. I wonder why this happens. Are there any recommendations on my desktop settings? Will it be possible to use Xgl in 4.1? I'm afraid you'll just have to work around the graphics driver issues until the vendors fix their stuff, sorry... You might try to complain at the NVidia forums? The standard ouput of kwin says something about missing compositing extension, which does not make sense as it works (slowly) when using xRender in Xgl, and anyway, compiz works at normal speed. If Xgl was a real, though temporary, fix that would really be nice ! Though KWin4 was showing good effects already using Xorg, its performance was simply in no comparison to what KWin3 has. But I always thought that was because it was still beta. But I tried XGL after seeing posts here and to my surprise (yes!) performance was near to what KWin3 has. For me all the effects (those which were also working before) were working with smooooothness. And scrolling is also smooth, which was not earlier even in KWrite. Though I had logged-in and out several times after enabling XGL, XGL was really not loaded at that time, it was only after restarting that system that I found that what Sebastian was saying was completely right. Btw I had disabled shadows. - Where is the new KDE4 menu Raptor? - small panel icons, e.g. kwalletmanager, doesn't have transparent backgrounds? - How can I move my icons in my panel? If you want to move icons to the desktop or panel then first you have to unlock the widgets (right click on desktop/panel - unlock widgets) then you can right click on any icon in the start menu and add it to the panel/desktop. You can also drag and drop the icons to any desired position on the panel or desktop. If you have a transparent panel (use the plasma-theme Glasified) then the icons should have transparent background given that you have a 3D video card which is properly (driver) configured. Sorry, I guess I misinterpreted moving the icons to the panel with moving them in the panel. It looks like it's still not possible to move them around in the panel like one can with Kicker. yes you can move the Icons within the Panel. Maybe openSuse did some extra tweaks to 4.0.4 but it's not possible to move icons within the taskbar with KDE 4.1 Beta 1 and 2. I don't believe the openSUSE team can commit directly to the KDE trunk. They can submit patches upstream and suggest the KDE devs commit them to trunk. According to openSUSE's idea pages, they do try whenever possible to submit upstream. It is then up to the KDE team to accept the patches or not. Many of the openSUSE members have write access to KDE's SVN. Actually I think all of us do: http://en.opensuse.org/KDE/Team . You should recognise a few of those names. Stephan Binner's comments about merging stuff back into Plasma describe normal interaction between a project and its periphery; the same traffic happens between KDE PIM and its Enterprise branch. I think you guys could possibly lay claim to the best shipped KDE desktop out there. Seriously, I'd love to see you guys work with the KDE Mod guys who develop the kdemod packages for Arch Linux. This is an openSUSE addition. 2)AFAIK thats not a KDE bug, but a X bug. The taskbar now automatically starts to use 2 rows if space is tight. As the other poster said, there are ways to get 2 rows by default with another taskbar plasmoid. First of all congratulation to the KDE team for reaching another millstone towards the upcoming and much anticipated KDE 4.1 release. KDE 4.1 continue to improve but there are quite a few programmes and plasmoids that I am missing in the recently released openSuse 11. Amarok - am I the only one who can't find Amarok 2 in openSuse 11 repos? Plasma extragear: extragear is available but in an outdated version that conflicts with the present KDE 4.1 beta release. I am also missing plasmoids like Flickr, where did Flickr disappear to? Bball is not in the repo and the Kweather plasmoid is also missing. Btw, has anyone here managed to migrate from Kmail 3 to 4 without much workaround? I guess extragear should be named kdeplasmoids as it was moved in repo. I have kdeplasmoids plasmoids installed but there are quite a few nice plasmoids that are missing. There was also a plasmoid that shows your partitions and other system infos, I don't remember the name but it's also missing. These were useful plasmoids that were working quite well in previous versons of KDE 4. Plasma went through a refactor so probably some plasmoids just aren't ready for KDE 4.1 yet. The package extragear-plasma has been renamed to kdeplasmoids4 in KDE:KDE4:UNSTABLE:Desktop because trunk/extragear/plasma was moved to trunk/KDE/kdeplasmoids in KDE SVN. If you used extragear-plasma previously, YaST should automatically upgrade extragear-plasma to kdeplasmoids4. Like I said, the package kdeplasmoids is installed (extragears not, although they can be found in the repo) but the plasmoids that I mentioned are nowhere to be found. What about Amarok 2? Have you found in in the openSuse repo? Amarok 2 is still in development. Re: Amarok 2 is still in development. I know but it's possible to install it on openSuse 10.3. I was using Amarok 2 until I updated my system to openSuse 11 a few days ago. first : i dont want to blame anyone . i just downloaded the opensuse live cd just to get a taste of the progress kde 4 has made . i am very pleased with the polished kde 4 opensuse has released the other day . so after the new kde 4.1 beta 2 desktop has appeared just right from the first klick i got a fatal error message after another . ok klicking it, helped to continue . but after trying to adjust somethimg i got a white screen - so goodbye kde 4 . whats that ??
" got a fatal error message after another "
Presumably the message said something more than just "fatal error" ... ?